Rock 'n' Roll Hall of Fame inductee Roger Waters has long been known as the musical genius behind Pink Floyd's stunning double-epic masterpiece known as The Wall. He made sure everyone had a chance to see his awesome updated production of that concept when he took that show on the road for over 200 performances from 2010 through 2013. Now, on his latest cycle he is mining the back catalogue for choice cuts one more time as he erects a new construction project on stage as seen when he and his large band played the Bridgestone Arena on August 13, 2107 in Nashville, Tennessee. Still, accolades and honors aside not everyone was happy to see Mr. Waters arrive in Music City. There was a large presence of protesters lined up outside of the arena to take a stand against Roger's positions and statements on Israel. 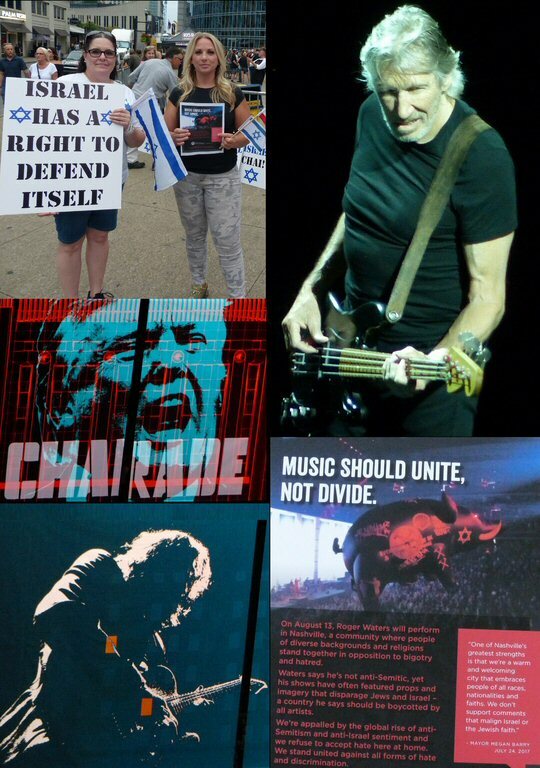 Roger has been a vocal advocate stating that the modern Jewish State practices apartheid and he has called on his fellow musicians not to play there. There were also Trump supporters holding signs backing the unpopular president who is a frequent target of the artist's ire in concert. 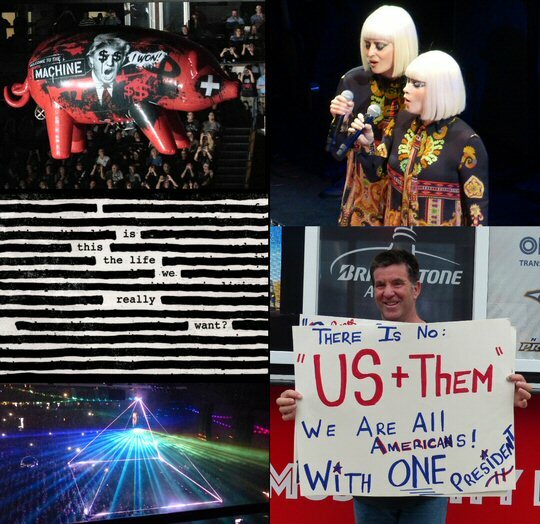 "United we stand, divided we fall," was a piece of musical wisdom popularized by the song "Hey You" from The Wall. Obviously, you can't please everyone all the time but clearly there was some bricks stacking against the 73-year old rocker from the get go on the outside of the venue. We headed inside to get a different perspective. After a long video featuring a lone figure sitting by the ocean the show crashed down upon the Nashville faithful as Pink Floyd classics washed over the crowd in waves of sights and sounds delivered with perfection by Water's well-honed band and production team. This concert marked the 40th and final gig of the first leg of the current US + THEM tour and at this point of the run everything was firing on all cylinders - just as you would expect from the hands-on detail oriented Mr. Waters. We don't want to give away too much but we will say we were engaged throughout every minute of this historic night in Tennessee. Waters sprinkled in several new tracks from his latest Is This the Life We Really Want? and the five songs he played were "When We Were Young", "Déjà Vu", "The Last Refugee", "Picture That" and "Smell the Roses". Many of these were stripped down on the studio release in acoustic bare bares fashion but they really came to life and fit perfectly in the overall theme when the full power of the band kicked in. Speaking of the band - they were: Roger Waters, of course, on bass, lead vocals, guitars; the very versatile Dave Kilminster on guitars, bass, talk box, backing vocals. He's been Waters' right hand man for the past decade consistently beside the legend for his past two tour cycles starting in 2006. The rest of the cast included Gus Seyffert - guitars, bass, keyboards, backing vocals; Jonathan Wilson - guitars, keyboards, lead and backing vocals; Drew Erickson - piano, keyboards, Hammond organ; Jon Carin - piano, keyboards, programming, lap steel guitar, guitars, lead and backing vocals; Ian Ritchie - saxophone, additional bass; Joey Waronker - drums, percussion; Jess Wolfe - lead and backing vocals, percussion; and, Holly Laessig - lead and backing vocals, percussion. It was in the second half of the night where things got really interesting. A floor long scaffold descended with red warning lights and soon the familiar image of the factory from the Animals album cover was erected before our eyes complete with pink inflatable pig. This was quite remarkable. 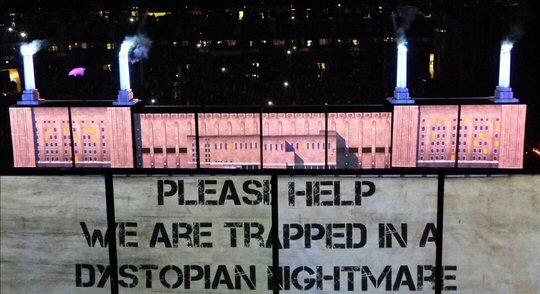 In addition to serving as a very large A/V screen for the duration of the concert it also worked to separate the audience in half - in effect building a wall between fans while creating an Us + Them dynamic as each section of the arena had a slightly different perspective on the evening's happenings. It was on the big screen that current U.S. President Donald J. Trump took the brunt of the shots fired from Waters and company. Let's just say that the three pack of "Pigs (Three Different Ones)", "Money" and "Us and Them" didn't paint the leader of the free world in the best light as songs from the early 1970's sounded even more pertinent and relevant in today's troubled times. Prior to the show closing "Conformably Numb" the band called an audible of "Mother" to mark the fact that maybe we were on the brink of nuclear annihilation. So much for a night of musical escapism but still we wouldn't have wanted to be anywhere else. The Bridgestone Arena in the heart of downtown Nashville is an award-winning arena and is home ice for the Predators. 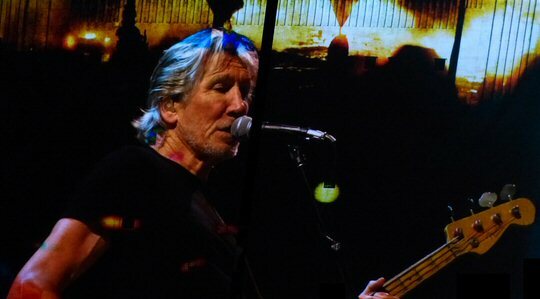 It also hosts a wide array of sporting and musical events such as Roger Waters. Upcoming events at the venue include Guns N' Roses, Foo Fighters, Chris Stapleton, Katy Perry and more.